When someone is kind enough to ask what my novel is about, I usually say, “It’s historical fiction based on the life of Sir Thomas More and his daughter, Margaret.” Then I often get a quizzical look. Not as in, “that’s weird” or “what are you talking about?” but more of a “wait, wait, I think I know something about Thomas More–wasn’t he . . . ” And then there is an awkward time of searching. Seems like most of us know the name Thomas More, but few know much about him. I count myself as one of the formerly confused. Afterall, there are so many Thomases in history–Thomas the Apostle, Thomas Aquinas, Thomas Jefferson and yes, that freaky-eyed little engine, Thomas the Train. While researching for my book I’ve gotten to know Thomas More quite personally. It is a shame that so many don’t know about this quintessential Renaissance Man: a writer, attorney, poet, scholar, loving father, educator, statesman and martyr. He loved life, laughter, learning, his children and his Faith. Sir Thomas was a man ahead of his time in many ways, and believed women were worthy of education. He provided a rigorous classical education for his daughters, though many ridiculed him for doing so. After turning down King Henry VIII a number of times, he eventually succumbed and accepted the position of Lord Chancellor of England. He became the most powerful man in England next to the King but was renown for his fairness, competence and, surprisingly, his humor. All was going swimmingly with the More family until Henry could not persuade Thomas to publicly accept his divorce from Queen Catherine and his marriage to Anne Boleyn. The King turned on his old friend with terrible vengeance and had More locked away in the Tower of London for more than 18 months, hoping to force a change of heart. When it was clear that Thomas More would not condone what he saw as a grave sin, Henry considered him a traitor and demanded his head. The End. This entry was posted in Uncategorized and tagged history, Thomas More, writing. Bookmark the permalink. 2 Responses to Thomas, Thomas, Thomas, Thomas. 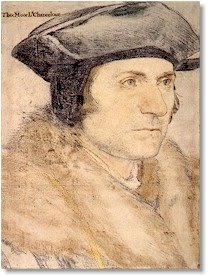 . .
Isn’t it nice that so many of Hans Holbein’s paintings and drawings survived and give us an idea of the faces of so many people from the Tudor era? I always wonder how true the likeness is. Wonder what Holbein would have thought of Thomas the Train?